The Union Hill neighborhood was long separated from the rest of Church Hill by a deep ravine. This physical isolation, combined with its hilly and rugged terrain, led to development of an independent community with a unique plan and distinctive architectural character. The name Union Hill, which first appears in 1817, was derived from the joining of two hills – Doing’s and Adams’. Topography did more to shape the character of Union Hill than any other factor. The cliffs overlooking Shockoe Valley formed the western edge of the neighborhood while a deep ravine that cut diagonally from the corner of Broad and 20th streets to N and 24th streets defined the southern limits. The land in between was hilly and rugged. In 1805, when John Adams and Benjamin Mosby laid out Union Hill for development they used an irregular street pattern to accommodate the hilly terrain. “They used a grid pattern, but instead of a rigid plan with equal size squares like that of Richmond, the grid was adapted to curve and climb with the hills. This resulted in several narrow, bending streets, and squares of various sizes and shapes.”‘ The terrain also isolated the community from the rest of Church Hill and the city. In 1853 a mile drive was necessary to get from Leigh Street Baptist to Asbury Methodist, three blocks away. As the hills were smoothed and the streets graded the foundations and basements of houses were often exposed. “Skied” is the term that Mary Wingfield Scott used to describe the effect of these raised houses with “their far-away porches reached by precipitous steps.”	In a few instances, the houses mimic the irregular angles of the blocks forming trapezoids rather than traditional rectangles. The one-story cottages, and other unique architectural forms give Union Hill a quality all its own. The early history of Union Hill is closely tied to (Colonel) Richard Adams (1726-1800) and his descendants. In 1761, shortly after arriving in Richmond, Richard Adams purchased 831 acres from William Byrd Ill. Later, in 1769 he acquired ten lots in Church Hill from Isaac Coles. Colonel Richard Adams believed that the future of Richmond lay to the east, and he acquired enormous tracts of land, not only within the city limits but on the northeast end of what we now call Church Hill, on Union Hill, and in the valley, which was then called Adams Valley. He had mills and various other business enterprises. So extensive were the Adams holdings that the estate of Richard Adams II (son of Col. Richard Adams I) was estimated to be worth $1,200.000 even in the low ebb of real estate in 1821. In 1805, John Adams (son of Col. Richard Adams I) and Benjamin Mosby laid out lots for development along the stage coach road to Williamsburg. As early as 1817, the coach road had been named for Abraham B. Venable. Venable, former Senator, and first president of the Bank of Virginia perished in the theater fire of 1811. Venable owned a large tract of land on the north side of the road between 18th and 21st streets. Along with 25th Street, Venable was the only thoroughfare that provided access to the heights east of Shockoe Valley, where it connected to Nine Mile Road and eventually with the road to Williamsburg. Scattered development took place at the base of Venable Street and along the heights overlooking Adam’s valley. The earliest known house on Union Hill was that of Henry Mettert. Mettert built his house at the corner of Venable and 18Ih streets, sometime between 1805 and 1810. Following the angle of the intersection, the two-story brick dwelling formed an obtuse angle. “Early plats show its odd shape, and also that east of it were a well, a pond, and the wooden tannery of Henry Mettert, who lived long in the house, and operated the Adams’ Valley Tannery.”‘ The Mettert House was demolished in the 1940s. Around 1813, Joshua Doing built his two-story brick home on the eminence that is now Jefferson Park and was then known as Doing’s hill. A two- story brick kitchen was attached to the rear of the house and in the yard were a brick smokehouse and a brick stable. The house was demolished long before the city purchased the land in 1887 for a park. George Howard built his house at 2224 Venable Street between 1817 and 1819. A frame wing and Greek Revival porches were added in the 1840s. Scott described the Howard House as “extraordinarily harmonious. When George Howard died in 1860 he left the house and a large parcel of land on Venable Street to his eight children. The house remained in the Howard family until it was demolished in 1930. The only building to survive on Union Hill from this early phase of development is the Adam Miller house, built at 2410 Venable Street in 1824. It is a two-story Flemish-bond brick dwelling set on a raised foundation. The house has a single pile, side hall plan. A two room, two-story addition was made to the north side of the house in the 1830s. When the house burned in the 1870s, a shed roof and a bracketed cornice replaced the stepped gable. Miller, who listed his occupation as farmer on the 1830 census, owned the entire block where his house sat and two additional blocks to the northwest. Early plats show a small frame kitchen located in the yard to the northeast of the house. It was typical for a house of this era to be situated on a large lot and surrounded by out buildings. The Antebellum Period witnessed tremendous expansion in the city of Richmond and on Union Hill. A few large houses were built on Striker’s Hill overlooking Shockoe Valley but the majority of the dwellings were modest homes for workers. Union Hill was both an economically and racially mixed neighborhood. As a result of Richmond’s increased industrialization, the practice of boarding out increased in the 1850s and slaves moved into free black neighborhoods. Many of Union Hill’s early residents were also German-born immigrants. Many of Union Hill’s more affluent residents built investment properties on the hill to accommodate the growing number of working class residents. Hiram Oliver was one of the earliest and most prolific investor builders. Oliver, a wealthy tobacconist, “put up small houses to rent here and there in Shed Town, on Union and Church hills. No two of them are alike, and most of them are attractive.” Among the houses attributed to Hiram Oliver on Union Hill are 701 and 703 North 23d Street, 2105 and 2202 to 2212 M Street. The dwellings at 2202 and 2204-2206 M Street have been demolished since 1990, and 2105 has been fairly drastically reconfigured. In 1820, Richmond had a population of 12,067. By 1860, the city’s population had grown to 37,910 and Richmond had become the third most affluent city in the nation. The city’s prosperity and growth was lead by three industries – tobacco, flour and iron. By 1835, the city’s industrial growth resulted in a demand for housing both by the factory owner and the worker. During this period it became profitable for the heirs of Richard Adams II to subdivide and sell their holdings on Union Hill. Most of the new houses were the modest dwellings for the working class – tailors, tanners, butchers, coach makers, teamsters, mechanics, painters, and carpenters. Union Hill’s more affluent residents such as “Elijah Baker, Frederick Brauer, George W. Barker, Joseph Augustine, Robert Alvis, Daniel von Groning and Jesse Talbott” built many houses as investments. Nearly eighty buildings from this period still stand on Union Hill. An equal number have disappeared in the past few decades. The history of Union Station Methodist Church in many ways parallels the development of Union Hill. Around 1835, two young men who were studying for the ministry began to hold services at various locations on Union Hill. The congregation continued to grow and in 1844 a lot was purchased on North 25th Street between N and O streets. By 1854, the congregation had swelled to 300 and a lot was purchased for a new building at the corner of 24th and N streets. The 1844 chapel, renamed Asbury Chapel, was turned over to the slaves and free-blacks who had worshiped with the congregation since the founding of the church. The new Union Station building was designed by Samuel Freeman and built by T.Wiley Davis. Samuel Freeman and his brother, John, were among the city’s earliest builder-architects. The designs of Old First Baptist and Centenary have been attributed to Samuel, as well as several major industrial buildings including the William H. Grant Tobacco Factory and the Yarbrough-Pohlig Factory. By 1867, the population of Union Hill had grown to such a degree the area was annexed into the city. As the population of Union Hill grew, so did the number of commercial and religious institutions within the community. However, the ravine that ran diagonally along the southern edge of Union Hill still physically isolated the neighborhood from the city. In 1882, the great divide at the southern edge of Union Hill was filled and graded to create Church Hill Avenue (renamed Jefferson Avenue in 1905). In 1887, the City purchased Doing’s Hill for a park. Marshall Park was enlarged at the turn of the century and renamed Jefferson Park. In 1888, the Sprague Electric Railway Motor Company designated Jefferson Avenue as a trolley route. This decision made commuting more feasible for existing residents and made the neighborhood more attractive to potential inhabitants. In addition to the construction of new dwellings on Union Hill this new found accessibility also resulted in the erection of churches, businesses and industries in the neighborhood to serve the inhabitants. Much of the residential construction was of a speculative nature to satisfy the growing demand for housing. Building fund associations and individual investors were active on Union Hill. R. P. Boze has been identified as the builder developer of 2009-2019 Venable Street. A group of investment houses built between 1907 and 1908 in the 2000 and 2100 blocks of M Street are noteworthy because they have been attributed to the architect D. Wiley Anderson and his partner lsaac T. Skinner, including the Queen Anne-style frame double houses at 2003-2005 and 2103 M Street and the Late Victorian style houses at 2108-2110 and 2112- 2114 M Street. E. S. Hitchcock has been identified as the contractor/builder of these four houses and 537 Mosby Street. The Colonial Revival-style apartments at 2304-2308 M Street and the Queen Anne-style house at 1916 and 1918- 1920 Princess Anne Avenue have been attributed to lsaac W. Throckmorton, architect. C. E. Hayward and George A. Dietrich were the builders for the houses on Princess Anne. Other builders that have been identified are J. W. Atkinson, Walter Douglas, George Skelton, and James Fox and Sons. Three churches were constructed on Union Hill during this period of Reconstruction and Growth. In 1884, after two disastrous fires that nearly ended Christ Episcopal Church’s existence, a new Romanesque Revival-style building was erected at 2120 Venable Street. Venable Street Baptist Church was built at 2101 Venable Street in 1891. The congregation began as a mission church in 1871 at 17th and Venable Streets. The new church was designed by M. J. Dimmock and built by D. Wiley Davis. By 1893, Union Station Methodist Church was again seeking larger quarters. Instead of moving to a new location the congregation opted to demolish the 1854 church and build new on the same site. The new Gothic Revival-style building has been attributed to Walter R. Higham. Higham was trained as an architect in his native England and came to Richmond to supervise the construction of the Richmond Masonic Temple. In 1879, Charles H. Hasker began manufacturing paper tags, labels and show cards in the woodshed behind his residence at 2312 N Street. The business grew rapidly and in 1885 he began manufacturing tin tags and impression plates for embossing plug tobacco in a two-story brick building erected at 810 North 24th Street. In 1890, he erected a four-story L-plan brick factory on Venable Street. The building was expanded in 1900 and 1915. American Can Company acquired the factory in 1901 and continued in operation until 1951. Demand for the specialized products of the factory had ceased, and the sophisticated machinery was not adaptable for other uses, and the factory was sold to be used as a warehouse. The property has since been renovated as housing for the elderly and disabled. Little residential development took place on Union Hill during this period as the neighborhood was substantially built out. The City Circle of the Baptist Woman’s Missionary Union constructed the House of Happiness, a community center, in 1923. It was the only public building erected on Union Hill during this period. The 1920s and 1930s did however see a growing number of commercial enterprises added to the fabric of Union Hill especially along Venable and 25th streets. A major trend was the conversion of residential buildings to commercial establishments. Thomas N. Curd established a drug store at the corner of 21st and Venable streets around 1910 and maintained his residence upstairs, similar to the arrangement of Elijah Baker in the 1850s. Around 1925, the Perkinson residence at 2007 Venable Street became Pendleton and Company, a purveyor of drygoods. Beverly R. Warriner converted the J. D. Whitehurst residence at 823 Noth 24th Street to a grocery store around 1932. Waniner also lived at this address. The Late Victorian dwelling at the corner of Venable and Mosby streets became the Baker’s Inn Confectionery in 1932. The Great A&P Tea Company occupied the first floor of 2025 Venable Street from 1923 to 1945. Mrs. M. E. Warren and her family (owners of the property) continued to occupy the second floor as they had done since 1906. New commercial buildings were also built during this period. Unique among these establishments was Perkinson’s Quality Ice Cream. In 1932, Perkinson built a small factory at 815 North 22nd Street and converted the residence at 2201 Venable Street to a retail outlet. Service stations were the most prolific of these new businesses, all of which were built in 1931. The Continental Oil Company filling station occupies the northeast corner of Venable and Mosby streets. The Fairmount Service Station was built at 2242 Venable Street and the Park View Service Station occupied the building at 2202 Jefferson Avenue (now Alamo BBQ). In the late 1930s and early 1940s. Union Hill and adjacent neighborhoods underwent both an economic and a demographic	transformation. While always a working	class neighborhood, Union Hill became impoverished and neglected. By the 1980s, the building stock in the neighborhood was showing signs of decline and many houses were vacant and boarded-up. 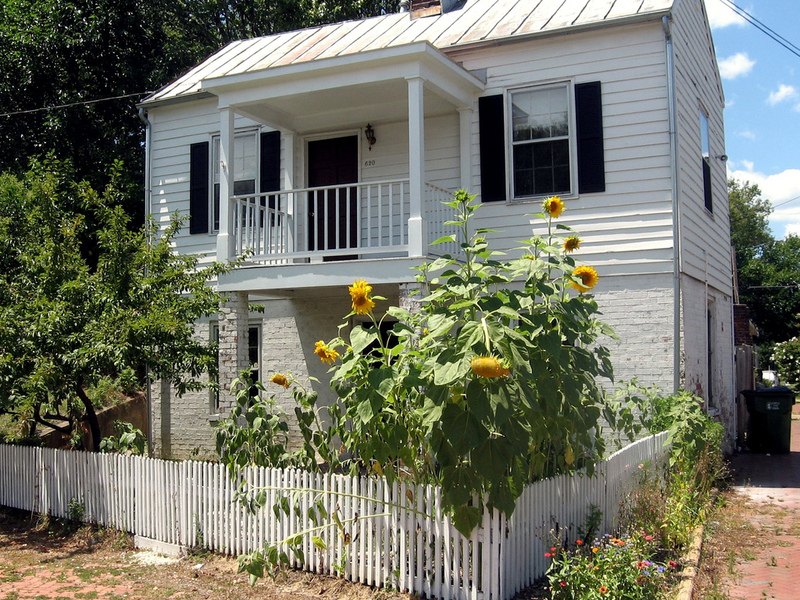 In 2000, the City of Richmond launched a new program called Neighborhoods in Bloom to provide funding for construction of new houses or rehabilitation of existing ones in six city neighborhoods, including Church Hill (which, for this program, is defined as including part of Union Hill). The Alliance to Conserve Old Richmond Neighborhoods has been instrumental in finding renovators that have saved a number of houses in Union Hill over the past few years, including renovations on 24th Street, M Street, and Venable Street. Better Housing Coalition has built a number compatible new houses on 23rd, 24th, Pink, and Carrington Streets, and private developers have picked up and fixed up many vacant houses over the past few years. Union Hill was listed on the National Register of Historic Places in 2002. On Monday, November 23, 2009, City Council will be considering adding Union Hill to the list of the city’s Old and Historic Districts. The first map indicates the boundaries of the Union Hill Historic District on the National Register of Historic Places. The second map indicates the boundaries of the proposed Union Hill Old & Historic District, a Richmond-specific designation to be voted on Monday evening at the City Council meeting . The text above is almost entirely sourced from the the registration form from the Union Hill application to the National Register of Historic Places (PDF). The original document, dated August 2001, was put together by Kim Chen and includes much more more than is shown here. Check out the original form to learn more about the Union Hill Historic District, or read up on any of the other sites in Richmond that are listed on the National Register. The map at the top is a detail from the city’s Richmond Districts and Sites on the National Register (PDF). The 2nd map is sourced from the city as well. Other embedded maps link to their sources or are from the author’s personal collection. All photos are by John Murden unless otherwise noted. Photos of 801 North 24th Street via Richmond City Watch, Bill Conkle, and Madge Goodrich via the Library of Virginia. Blight in the 1980s photos are from the Virginia Film Office. Photos of Venable&Tulip and 2121 Venable Street are from the Built in America collection, part of the American Memory from the Library of Congress. Photo of 705 North 23rd Street by taberandrew. 2101 & 2025 Venable Street and 513 Mosby Street are the Richmond Esthetic Survey via Library of Virginia. “Trolley on Jefferson Avenue” is from an unknown source. Jefferson Park postcard is from VCU’s Rarely Seen Richmond. John, what a beautiful and thoughtful tribute to a neighborhood that remains unique in all of Richmond. No matter what happens tomorrow, Union Hill has regained its sense of place and identity, thanks in large part to the work of citizens like you. We are indebted. Yes John, thanks very much for posting this piece. I especially enjoy the discussion highlighted above re: 2105 M St. Pay attention to the comments section posts #s 2,3 & 13. Keep in mind that posters 3 & 13 are both proponents of an OH&D. This is precisely the reason for not having such an invasive mandate against our neighbors, some of whom have lived in the neighborhood for 50+ years. While reading some of the comments from the 2105 M St post, keep in mind that the developer specifically went to CAR of his own accord, without the OH&D mandate. John, I fell asleep at the end of the Eagles’ game and got up to check whether they won or not and decided to check CHPN. This compilation is such a wonderful gift to our neighborhood. I agree with Matt in that our neighborhood has such an amazing story to tell, but our best days are still ahead of us. Thank you for pulling all this history and related pictures together. April – I’m not sure that the comments that you reference say what you think that they do. In comment #13 in the discussion of 2105, they are saying that they went to CAR on another project (at 26th Street & Leigh Street, in the Church Hill North O&H). What a beautiful neighborhood and write-up. We support your designation. Thanks John. It appears you are correct. And yet the entire thread there is evidence of the hysteria surrounding the Taste Police and their efforts to make people think that such a structure alters the historic fabric of the neighborhood– which it in fact does not. It is important to keep in mind that Jewels Inc is a proponent of the OH&D legislation. It may also be important to note that the person(s) currently residing @ 2105 M St is/are probably horrified to know what neighbors think of their new home. Union Hill is an incredible place that deserves this honor and protection! Cedar Street Baptist Church, whose history is really the history of our neighborhood, has written a beautiful letter of support, as well. @6, you’re grasping at the straws of an irrelevant discussion, in an attempt to defend a selfish position. First of all, Mr. O’Kelly of Jewels, a resident of Union Hill, still owns the home you’re referring to, and is an ARDENT supporter the Union Hill City Old & Historic District. Also, if you go back an look at that that thread, the folks who didn’t like the house don’t live in Union Hill. If you look carefully, you’ll see that Union Hill residents actually defended Mr. O’Kelly/Jewels. C’mon April, it’s obvious that you just don’t like the fact that the same citizens who plant trees, pick up trash, care for Jeff. Park and feed the homeless got together to do what is best for the future of our neighborhood. You have chosen not to get involved in any productive way in this community, and now, all you can do is try to drag it down when we are moving forward in a way that will actually benefit you and your household. Nevertheless, we are happy to share with you all the blessings that a Union Hill City Old & Historic District would bring to this community. haha, it’s very hard to dignify post # 8 with a response. It seems the initiative takes the notions of ‘love it or leave it’ and ‘you’re either with us or against us’ as being valid arguments- which is silly. Nonetheless, from the beginning the proponents of this initiative have consistently viewed any other opinion than theirs to be not only wrong, but abhorrent and ‘against the neighborhood’, which couldn’t be further from the truth. No, to their discredit they undervalue the opinion of the neighbors they supposedly represent. So much so that the initiative, in it’s two years of ‘hard work’ failed to ask their neighbors opinions. Upon finally hearing said opinions they lash out as CapitalGal has shown. CapitalGal, are you aware of the petition with 157 signatures against the initiative? You should also be aware that this brings the tally of opponents to 220. A wide majority BTW. Shouldn’t it be clear from now on, regardless of how Council votes today, that the majority opinion is against the initiative? Thanks again for consulting your neighbors on this one. And thanks also for picking up trash. Most residents in the city do, including me. @9. The official city surveys are the ONLY objective measure of Union Hill property-owner sentiment regarding the district. Your petition is not valid (see points made below). -59% of respondents chose “I Support” on the response card. In the last election, the our new council person garnered 51% of the vote. The governor-elect won with 58% of the vote and that was considered a landslide. -the Survey Cards, which could be completed and returned in private, gave respondents the option of “support” “do not support” or “no opinion”. -Your petition only gave the respondent one choice: to oppose the district. Members of the Planning Commission pointed this out last week, and thus, cast the petition aside as an invalid document. -There are reports from neighbors that petitioners were heard to use fear mongering rhetoric with some of the folks they asked to sign. Honestly, if someone walked up to me and said “I’ll lose my house if this goes thru” i might sign a petition against it, too. But saying someone would lose their house if an O&HD happens is a falsehood. There are plenty of seniors and low income folks living in City O&HD’s like Jackson Ward and Church Hill North. Folks don’t get “pushed out”. -Finally, another petition was circulated that asked signers to support the district. Many of those folks signed that petition after they signed the opposition’s. Further evidence that the petition you are referring to is an invalid representation of property owner opinion. I support the O&HD because I believe our neighborhood will be better off 25 years from now if we are designated as a City Old and Historic District today. I think the historic fabric of Union Hill and the “sense of place” will be well served with this status. Some of my neighbors disagree, but at the end of the day, we are neighbors. You can purchase it on Amazon.com for about $30 or so. I think it’s wonderful all the changes that have taken place in Union Hill. However, I used to live on Venable St. in 1996 and was robbed at gun-point in my own yard. It’s quite amazing all the changes, and some of the renovations are beautiful. You still would never get me to live over there again, it’s that part of chuch hill that recently made the top 10 most dangerous neighborhoods in the U.S. Therefore, I can only conclude it hasn’t changed in reference to crime. Church hill is still my home, and will be for many more years. However, I’ll remain across from Chimbo. park, my house is huge and I feel a lot safer over here. I do highly support all that’s taken place over there, but the vinyl sided houses are gross. And we have our share of them in our district as well. I wish you all luck on stopping the renovation, and new contruction of vinyl sided houses. We’ve had little luck stopping them in our district. I’ve complained about it until I’m my face has gone green to “ARC” about it. They never do anything, and hopefully you’ll have much better luck. You really need to push for the detruction of Mosby Court. If you can get rid of that element, your neighborhood would be much safer. In response to Church Hill being named the “10th Most Dangerous Neighborhood in America”, Matt Conrad of the Union Hill Civic Association had data provided by Lt. Laino of Sector 111 that brings some perspective to the designation (PDF). The data makes very clear what residents of the Union Hill and Church Hill North already know: crime is not only down from a few years ago, but is dramatically down from 6 and 7 years ago. There were 205 violent or property crimes in Union Hill in 2003, last year there were but 75. Church Hill North saw 330 violent or property crimes in 2002, but only 117 in 2008. Somewhere in the middle of this historic decline, an area comprised of part of each of these neighborhoods was theoretically so bad statistically that it qualified as one of the most dangerous in the county. In an email sharing Laino’s data with Union Hill residents, though, Conrad points out that “WalletPop predicted 169 violent crimes in the area they selected over the next year. In reality, there were only 27 violent crimes in the entirety of Union Hill and Church Hill North during the last full year” of data. I’m so glad to see your post on the crime in church hill. It’s great that we’re becoming a safer place to live. However, we still have the stigma of being so dangerous. I personally get sick of my west end friends asking me “how do you like church hill, are you scared”. We do have more crime than the west end, and so does the fan. The fan has a great deal of crime. It is my opinion if we could get rid of Mosby court, the crime rate would decline even more. I love the area over there, and it was very tempting to buy one of those houses across from Jefferson Park. Although, it was a great temptation, I still remember that gun in my face. It’s not to say it couldn’t happen to me today over here. However, I feel it’s a mental thing on how a person feels. You all stand together, and work hard to prevent anymore vinyl sided houses. The main problem I have over here is the neighbors refuse to stand with me and complain. It’s my dream we’ll have a neighborhood up here that we can all someday walk safely to shops etc. Happy Thanksgiving to you and all of church hill. When my grandparents lived at 510 N 22nd St. in the 40’s and 50’s, we had to take a little elevator on the bridge to reach the Shockoe Valley area. I thought that was neat, and my first ride on an elevator. Does anybody know anything about the building at 2501 E Franklin. It’s currently condo units. Really enjoyed reading this article with my dad. My dad is 95 and grew up in Churchill. He remembers many of the business mentioned.